The most jaw-dropping new art space in Chicago isn’t a multimillion-dollar museum expansion designed by a five-star architect and funded by a major capital campaign. That may be the international trend inaugurated in 1997 by Frank Gehry’s Guggenheim in Bilbao, Spain, and which continues unabated on Saadiyat Island off the coast of Abu Dhabi in the United Arab Emirates, where the Louvre is building a subsidiary by Jean Nouvel. Chicago’s entries into the category include Renzo Piano’s elegant but dull Modern Wing for the Art Institute and, most recently, the MCA’s smart and hip renovation of its public spaces by Johnston and Marklee. No, the venue that everyone and their mother should visit right away is the Roundhouse, a former horse stable in Washington Park that’s been closed to the public for decades. It’s hardly a barn, though. Built in 1880 by architect and planner Daniel Burnham, the 61,000-square-foot stone structure extends off a monumental central gallery crowned with pretty windows and a wooden starburst ceiling that rises atop impossibly narrow steel columns. 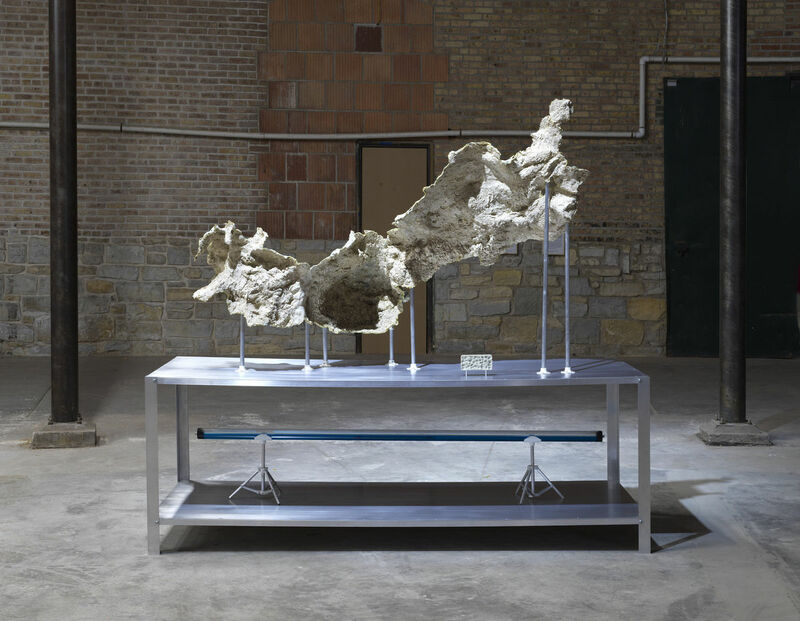 Until Oct. 29, the Roundhouse will be filled with “Singing Stones,” an exhibition by a group of 11 artists and one collective from France and Chicago. 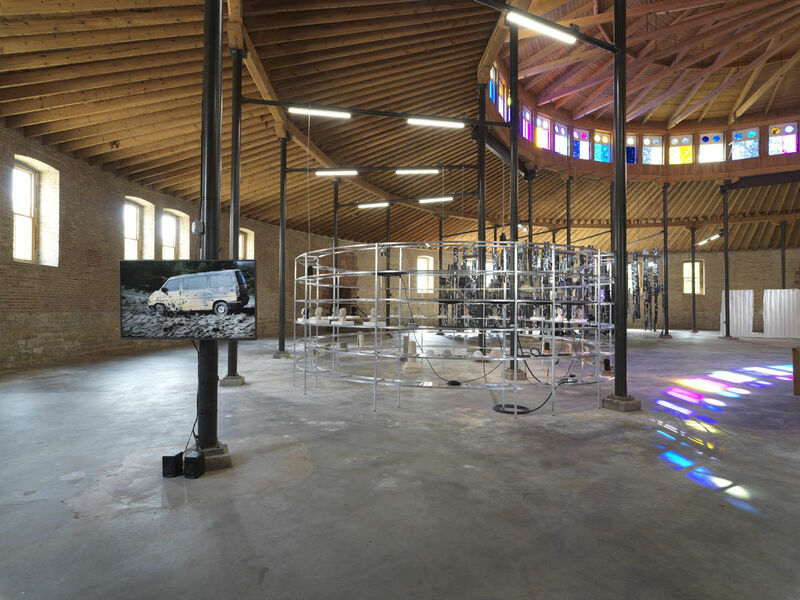 Curated by Katell Jaffres of the Palais de Tokyo, the famed contemporary art center in Paris, there isn’t too much to make of the French connection, other than bilingual wall texts, awkward translations and the notable fact that it works. 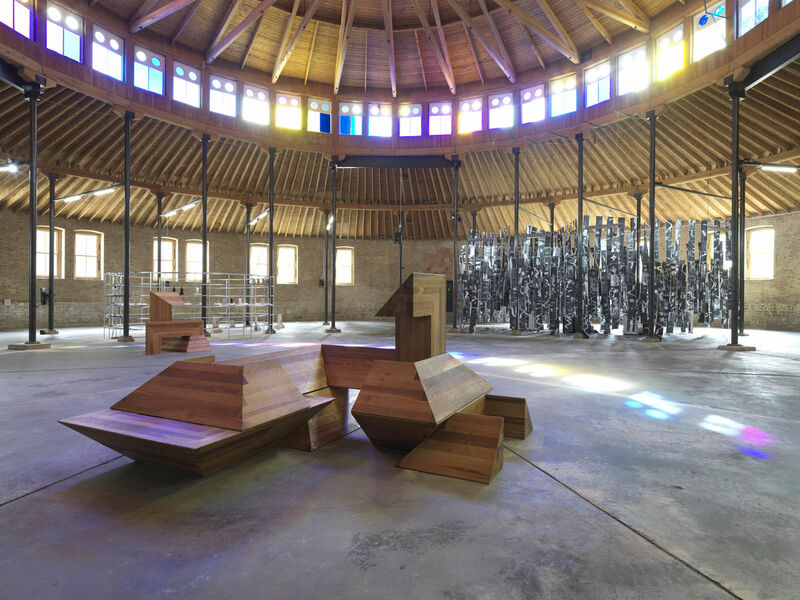 “Singing Stones” offers an unpredictable variety of artworks, by a unique array of emerging artists, installed just so in an extraordinary space. If only most exhibitions could get that much right. Highlights include Andrew Schachman’s “Observatory,” a plain wooden podium that visitors can ascend to get a good look around. From it, bask in the glory of Cauleen Smith’s “The Right Time, Before and After,” an ever-changing rainbow of light that streams through the rotunda’s windows thanks to mismatched cinema filters. Follow Smith’s prism as it casts its colors around the space, marking time and artworks as it passes. Wind sensuously through Thomas Teurlai’s “Scores for Bodies and Machines,” a dense tangle of black-and-white paper scrolls hung from above. 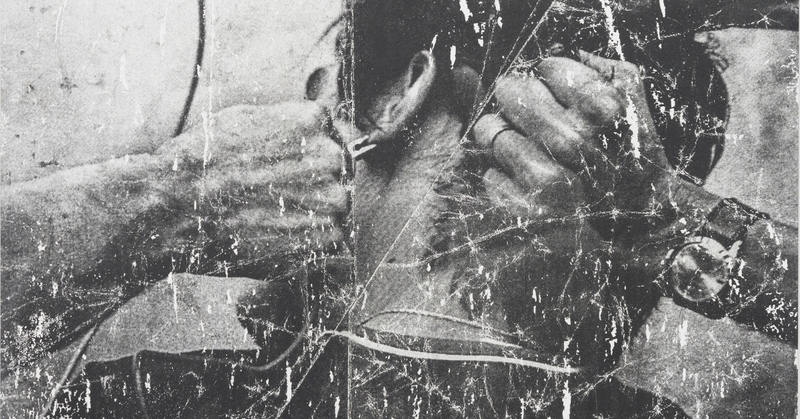 At its center sit three photocopiers, upon whose glass two dancers pressed their bodies during opening-day performances in order to generate the hundreds of facsimiles that make up the installation. Pause to be baffled by Guillaume Leblon’s five white curtains, hard wavy walls cast from resin that resemble giant sheets of lasagna and hover magically an inch above the concrete floor. Caught between their folds are sculptures of an orange, a child’s torso, a slice of watermelon, a fish and other items that a surrealist might have encountered on an urban stroll. Rest for a moment on Raphael Zarka’s “Paving Space,” a dozen angular solid oak shapes that intertwine in innumerable reconfigurations to form seats, nooks, benches and a bespoke skateboarding ramp. (A video shows skaters performing tricks atop the artwork in other venues.) Wish for a skateboard and some related skills. 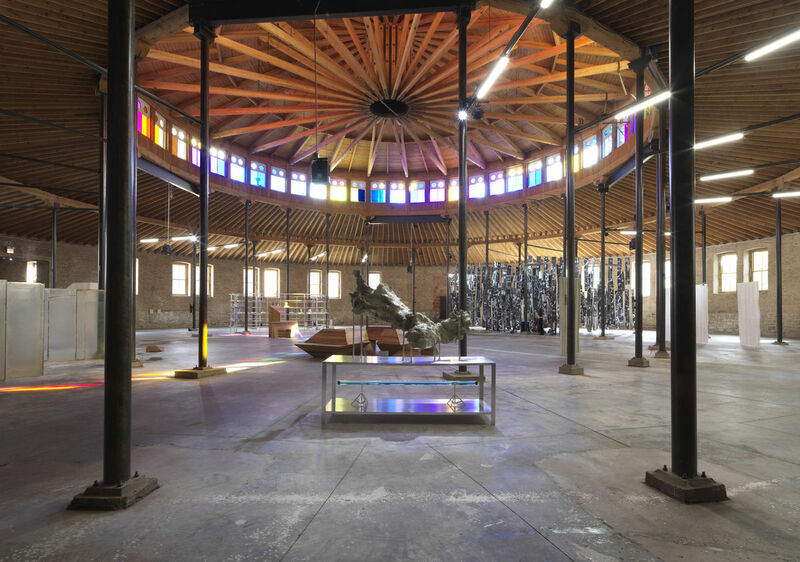 Wander tentatively through Wilfrid Almendra’s maze of mottled glass pavilions. Find among them a stack of ethereally concrete poems written by a Portuguese friend of the artist and a pair of rocks mysteriously connected to the building via copper wires. Wonder what’s being transmitted. Be careful not to bump into the scrappy sculptures of Dorian Gaudin, all spindly metal, plastic plants and simple motors. Don’t be too startled when they move. Finally, circle around the Floating Museum’s “Echo Location,” a ring of steel shelves that displays a show within the show. It’s all about reflection: a video by Florian Pugnaire and David Raffini bounces off plexiglass sheets that angle above horizontal monitors; 3-D printed copies of busts from the collection of the DuSable Museum of African American History begin with precision but progress through doubling and tripling; more traditional models of architectural elements of the Roundhouse enshrine the surroundings. The Floating Museum — a collective made up of Schachman, Avery R. Young, Jeremiah Hulsebos-Spofford and Faheem Majeed — proposes an idea of museums for today: adaptive, communal, open, temporary. 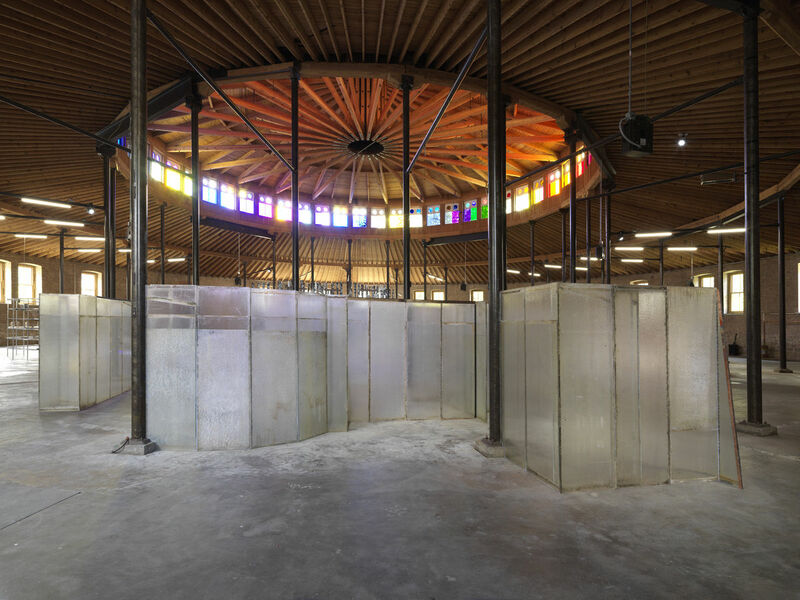 It’s a bold gesture to make from inside “Singing Stones,” which marks the first and for now the only public use that has been made of the Roundhouse since the Park District turned it into a storage facility in the 1930s. The DuSable, across the street, took over the lease of the building in the early aughts with plans for an ambitious expansion that has started and stopped and now, hopefully, started again. The space remains a grand and beautiful shell in need of millions of dollars of work. That’s money that visual arts museums seem constantly able to raise for their own shiny new building projects — from Chicago to Saadiyat Island — thanks in part to the vast prestige of contemporary art and the deep pockets and excellent connections of those individuals, corporations and governmental figures who wish to be associated with it. 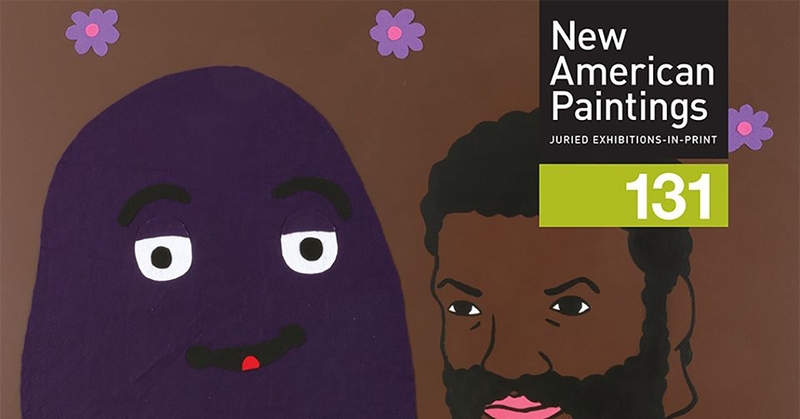 Maybe the all-consuming force of gentrification that so often follows in art’s wake can here be wielded for something better. Maybe some of the attention brought to the Roundhouse via “Singing Stones” — and its partnerships with Expo Chicago, the Architecture Biennial, the Institut Francais and the French Embassy — can be diverted from the pure pleasure of seeing good art in a great place to seeing that great place become the extended home of an institution that really needs it: the DuSable. “Singing Stones” runs through Oct. 29 at the Roundhouse, 740 E. 56th Place, 773-947-0600, www.expochicago.com/programs/palais-de-tokyo-hors-les-murs.